This Black-Framed Sign Supply With LEDs Highlights Your Message With Different Color Lights! Sign Supplies Are Our Business! This is Only One of Hundreds of Models of Sign Supplies! Common Size: 25" x 18"
Neon marker board features 13 different flashing neon settings! 18" x 25" write-on bulletin board allows you to erase and change your message as needed! Board includes full neon marker set for your convenience! 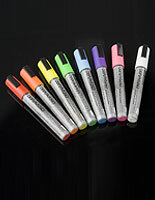 Bright fluorescent colors on black writing surface attract attention! This menu exhibit, professional sign supply that displays custom messages is a well-lit black fluorescent bulletin board. The varying illuminations enable you to select which will appear best in your atmosphere. One edge of the composing board comes with red, green, and blue LED lights that light up your composed communication. 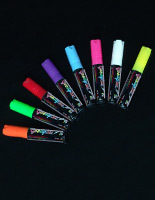 The sign supply that lights up comes with a kit of fluorescent marker pens that has eight wonderful colorings to utilize. This sign supply sports an edge-illuminated composition with red, blue and green lights inside the framing. Once plugged in, select from thirteen (13) varying lighting effects for this exhibit. Merely press the button on the outside of this sign supply with easel to toggle through the effects. Watch the video beneath to view the full array of lighting effects! This contemporary sign supply that lights up with LEDs is sent with tools for wall-affixing or suspending from a ceiling. Set up the exhibit close to almost any place in the business. The sign supply with marker pens also comes with a unique, non-abrasive towel to erase your tailor made communication. This sign supply is the perfect merchandise to capture the awareness of your targeted market. Write or draw your promotions and campaigns. This sign supply, also recognized as a bulletin board, is a blackboard exhibit with a couple of brilliantly-colored marker pens. The fluorescent marker pens on a black surface area will make your text stick out. The quality sign supply with wall or ceiling brackets is ideal as a menu board in an eatery and could also be utilized in commercial or servicing-oriented locations like hair salons or airports. Several eateries and athletics bars like to utilize these exhibits to mention their daily deals as they are constantly changing. 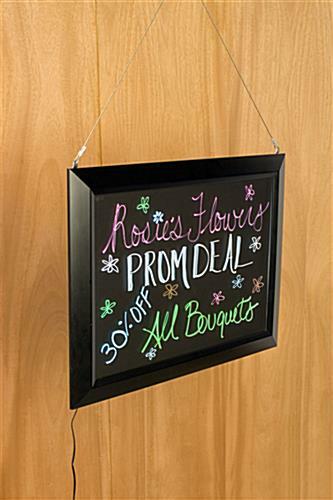 This sign supply is the ideal blackboard for any sales proprietor searching to convey promotions, forthcoming occasions, campaigns, and more! Personalize your text and phrases so that they will appeal to your clients. The write-on design of this sign supply permits you to make a new, tailor made communication as often as you'd like. 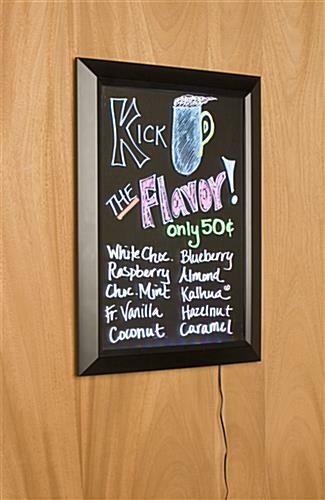 Own an eatery and tired of using letter boards as your menu board? Utilize this sign supply as your food list panel! 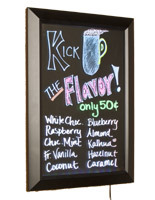 You are able to modify your promotions immediately and even add some graphics to your food list board! 27.8" x 18.3" x 1.0"